Barry served as a law clerk to the Honorable Jay S. Bybee of the U.S. Court of Appeals for the Ninth Circuit and practiced law in the New York office of Fried, Frank, Harris, Shriver & Jacobson. He visited at the University of Michigan Law School in Fall 2013. Barry joined the USD School of Law faculty in 2010. Barry served as managing editor of the Stanford Law Review. He is a member of the American Economics Association, American Bar Association, and the American Law and Economics Association. 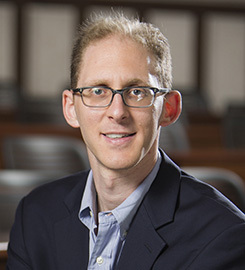 He received USD's Thorsnes Prize for Excellence in Teaching in 2012, was named Herzog Endowed Scholar for both 2014-15 and 2015-16, and was awarded by student determination a "Favorite Faculty Member" by the USD School of Law’s Public Interest Law Foundation from 2011-12. “Taxation and Innovation: The Sharing Economy as a Case Study” in Nestor Davidson, Michèle Finck and John Infranca, Cambridge Handbook on Law and Regulation of the Sharing Economy (Cambridge University Press, forthcoming 2018); “Tax Regulation, Transportation Innovation, and the Sharing Economy” in 81 University of Chicago Law Review Dialogue 69 (with Caron) (2014); “The Emerging Consensus for Cutting the Corporate Income Tax Rate” (solicited piece) in 18 Chapman Law Review 19 (2014); “On Derivatives Markets and Social Welfare: A Theory of Empty Voting and Hidden Ownership” in 99 Virginia Law Review 1103 (with Hatfield, and Kominers) (2013); “Is the Individual Mandate Really Mandatory?” in 135 Tax Notes 1633 (with Camp) (2012); “Pills and Partisans: Understanding Takeover Defenses” in 160 University of Pennsylvania Law Review 633 (with Hatfield) (2012); “Prosecuting the Exonerated: Actual Innocence and the Double Jeopardy Clause” in 64 Stanford Law Review 535 (2012); and “On Regulatory Arbitrage” in 89 Texas Law Review See Also 69 (2011). Submit changes to Jordan Barry's profile.